Can you forgive a Nazi sympathizer? It’s a question that, sadly, feels more relevant than ever in 2017. Are those who’ve been seduced by the Nazi ethos gone forever or is there hope of getting them back? And if you do break them from their Nazi trance, how do you move forward knowing their true beliefs? Should forgiveness even be an option? Those are complex questions with no clear-cut answers, but that doesn’t stop The Crown from asking them anyway. Whereas “Marionettes” told an engaging but relatively straightforward historical story, “Vergangenheit” offers something far more complex. It also course corrects a historical gap from the show’s first season. 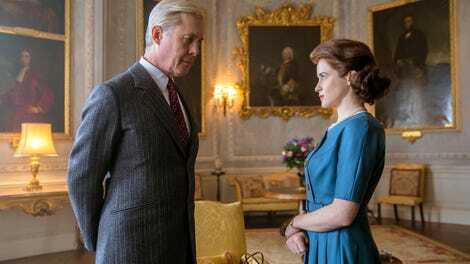 I have no idea if Peter Morgan always envisioned this episode in his conception of The Crown’s six season arc, but I could also see it emerging in response to critiques that Edward and Walls’ Nazi connections went unmentioned in The Crown’s first season. Regardless, the benefit of waiting so long to reveal this side of Edward is that we get to experience the reveal alongside Elizabeth. That centers her in this episode and makes it as much her story as his. Given that he’s the only person who has even an inkling of what it’s like to be in her shoes, Elizabeth has always been inclined to treat Edward more kindly than most. And in outline form, it’s easy to see Edward as a romantic hero (he’s certainly the first to spin that narrative about himself). Or, at the very least, it’s easy to see him as a tragic figure, as The Crown so often did in its first season. Edward clearly doesn’t have a lot of purpose in his life anymore. He and Wallis have nothing to do but throw birthday parties for their pugs and costume parties for their friends. They love and hate each other in equal measure. Their tempestuous relationship is right out of a Noel Coward play. “I never thought I’d hear myself say it, but a life of pleasure really has its limits,” Edward sighs. “Try a life spent living with you,” Wallis shoots back. 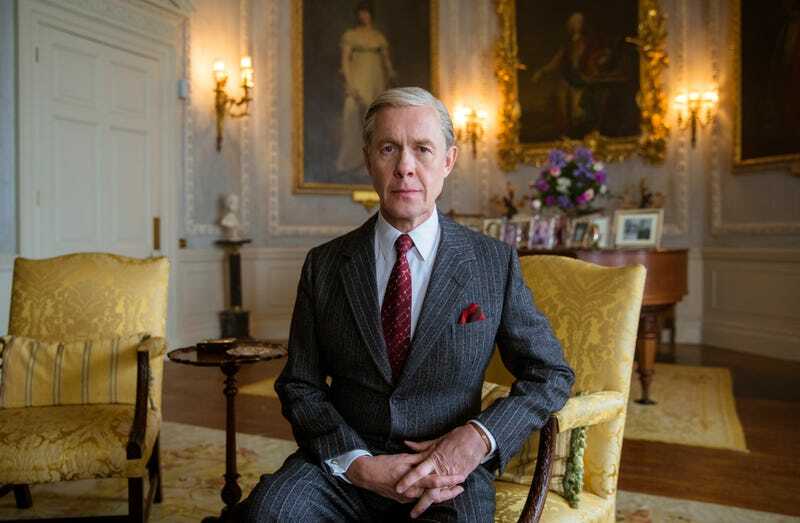 Coupled with Alex Jennings engaging performance, Edward is someone it’s easy to root for, even if he’s far from a traditional hero. He’s more fun than the stuffy Windsor royals, and his request for a job (something glamorous but not too difficult) seems reasonable enough by The Crown standards. But “Vergangenheit” takes our preconceived notions about Edward and turns them on their head. While her uncle is looking for purpose via a new job, Elizabeth is searching for purpose of a higher sort. So far The Crown hasn’t spent much time exploring the fact that Elizabeth is the head of the Church of England. It’s a position that almost feels incidental. Most religious leaders choose to devote their lives to serving God, but Elizabeth earned her religious stature by the virtue of her birth. And it’s lonely to have no one above her but God. Inviting America’s celebrity preacher Billy Graham (a wonderful Paul Sparks) to give a sermon is a rare chance for Elizabeth to experience what it’s like to be a “simple congregant being taught, being led.” And it’s an experience she clearly relishes. It’s another reminder that Elizabeth wasn’t necessarily the most natural fit for her royal duty. She’d rather be living a simpler life as a wife, mother, and churchgoer. Elizabeth’s bout of spiritual examination puts her in an interesting head space to deal with the reveal that her uncle was a Nazi sympathizer. Her conversations with Graham become a sounding board for her feelings towards Edward. How much this episode plays as a mystery will depend on how much history you knew going in to it, but there are really two questions at play in “Vergangenheit.” The first is “What did Edward do?” and the second is “Can he be forgiven for it?” And The Crown recognizes that the latter depends entirely on the former. Elizabeth does consider forgiving Edward after hearing his artfully spun tale about how he considered working with Germany only as a way to bring about peace. He tells Elizabeth he had no indication of who Hitler would become and that perhaps it was England’s refusal to become Germany’s ally that turned him into a monster. He claims that all he wanted was to avoid revisiting the horrors of World War I. But Tommy Lascelles tells a different story. He couldn’t be more unequivocal about Edward’s Nazi connections. The palace had to go so far as to hide sensitive materials from Edward’s red box so as to prevent them from being shared with Wallis, who would go on to share them with Nazi agents. Rather than quietly retire from public life after his abdication, Edward and Wallis went to visit Hitler on an “unofficial state visit.” They even created a plan to reinstate Edward as King of England in exchange for giving German forces free reign across Europe. Though Edward claims he was ignorant about Germany’s real aims, it turns out his visit included trips to both SS training schools and early versions of the concentration camps. It’s shocking, damning stuff, and Elizabeth takes it as such. “There is no possibility of me forgiving you,” she finally tells Edward. But that’s a notion that bothers her, to the point where she sends for Graham again. Being a Christian means forgiving everyone, just as Jesus forgave even those who killed him. How can she rectify her justified condemnation with her Christian charity? Graham offers some genuinely great advice: You’re human, you don’t have to be perfect. Not everything has to fit within an all-encompassing moral philosophy. If you can’t forgive someone, pray for them and ask for forgiveness for your own imperfections. It’s a lovely summation of the Christian ethos, not to mention a welcome critique of Nazi sympathizers. No, Nazis don’t need to be let back into the fold because they’re family or because they’ve changed or because they weren’t the worst of the worst. The Crown doesn’t do much to connect “Vergangenheit” to our present era. But intentional or not, it’s an episode—and a message—that couldn’t feel more timely. The episode ends with damning photos of the real-life Edward on his tour of Nazi Germany, including one in which he’s standing next to Hitler. It’s lovely to have both John Lithgow’s Winston Churchill and Jared Harris’s King George back for brief cameos in this episode’s cold open. Unlike in “A Company Of Men,” where the accuracy of Mike’s letters was in no way challenged by the show’s visuals, here Edward’s letters to Wallis (a.k.a. Peaches) show the extent to which he’s exaggerating. One man removing his hat becomes “a large group of welcoming supporters” cheering his name and removing their hats. There’s perhaps no more telling character moment in this episode than Edward’s halfhearted sieg heil. Michael and the Queen Mother negotiating who is going to tell Elizabeth the story of the hidden Nazi files. Everything about Tommy and his battle recreation.